In a once rare property crime now trending higher around the world, thieves are stealing precious metals from automobiles. These opportunistic criminals don’t bother rummaging through glove compartments in the hope of finding stashed jewelry or gold coins. Instead, they go for the near certain score of exposed catalytic converters. A car’s catalytic converter is attached to its exhaust system and converts toxic emissions into less harmful byproducts. It contains corrosion-resistant noble metals – typically platinum, palladium, and/or rhodium – in relatively small quantities. Those relatively small quantities are becoming relatively more valuable, especially in the case of palladium. “Soaring palladium prices are inspiring an unusual band of criminals: catalytic converter thieves,” reported the Wall Street Journal. In February, palladium prices spiked to a record $1,550/oz where they have remained. Fears of a chronic supply deficit are prompting not only thefts of auto catalysts, but also panic buying of palladium by industrial users and abnormalities in futures and leasing markets including backwardation and double-digit lease rates. Since early 2016, the palladium spot price has more than tripled – from just under $500/oz. to over $1,500/oz. Despite the huge move, demand for palladium continues to outstrip supply. The move may be far from finished. 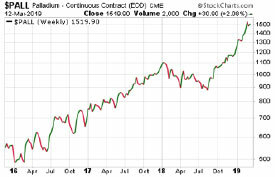 However, long-term investors who are focused on finding value – who aim to buy low when markets are depressed and out of favor – likely won’t find palladium attractive at these lofty levels. But they may find palladium’s recent tripling encouraging for the prospects of other metals that have been beaten down and overlooked by most investors. Platinum, for example, now trades at an historically large discount verses its sister metal palladium. The discount (now close to $700/oz) is all the more interesting given that platinum is a viable substitute for palladium in catalytic converters. Of course, automakers can’t switch to the cheaper precious metal on a dime. In recent years, they have opted for palladium in most non-diesel gasoline vehicles. They’d have to re-tool their production process for platinum-based converters. The longer platinum remains deeply discounted, the more switching can be expected to take place. New demand for platinum would help close the price gap with palladium. Since both metals’ fortunes are heavily tied to automotive demand, they are also vulnerable to a potential downturn in auto sales due to recession – and longer term to growth in the market share of electric vehicles, which have no emissions systems. Electric vehicle batteries do require other metals, including lithium, cobalt, and nickel. The computer-controlled electronic systems in today’s cars also contain some silver. Meanwhile, the solar panel systems that alternative energy enthusiasts imagine will one day power every vehicle and home in the country are one of the fastest growing industrial sources of silver demand. Unlike platinum and palladium, silver has a long history of use as money. Even though silver is no longer minted into coins meant for circulation, it is still sought after by investors in coins and other forms for wealth preservation, inflation protection, and possible future use in barter or trade. Like platinum, silver looks extremely cheap when measured against palladium. Over the past three years while palladium has tripled in price, platinum has actually lost a few dollars. Silver is essentially unchanged over that period. Silver is so cheap at under $15.50/oz. that even if it goes on to follow in palladium’s footsteps and triples in value, it will still sit below its former all-time high of $49.50/oz.! What other asset class offers the opportunity to triple your money as a warm-up before prices break to new highs? Not stocks. Not bonds. Not real estate. The value opportunity that now exists in silver is unique. But not unprecedented. Silver has been extremely depressed before…and gone on to post spectacular bull market gains. If silver enters a mania phase like it did in the late 1970s, you can expect to see all sorts of headlines about supply deficits, panic buying among industrial users, rampant speculation in futures markets, a possible default on futures contracts for physical metal, thieves and scam artists coming out of the woodwork, and so on. Right now the mainstream financial media isn’t finding much to write about in the silver market. Big banks and other institutional traders take out enormous short positions in the COMEX, confident that speculative “buyers” on the other side won’t demand to take delivery of physical metal. The shenanigans that take place in rigged paper markets are just business as usual…for now. But when real physical shortages emerge, the price suppression efforts on the futures markets may finally fail spectacularly. The most vulnerable market right now is palladium. Craig Hemke of the TF Metals Report warns the COMEX could declare a force majeure because only 42,000 ounces of palladium exist in their vaults – only enough for 420 contracts. Losses on palladium contracts gone bad could dwarf losses caused by catalytic converter thieves! A similar leverage factor exists in gold and silver markets, where only a tiny fraction of futures contracts is covered by physical inventories. A futures contract on a precious metal does not amount to actual physical ownership. The only way to make sure you participate fully in a bull market for a scarce metal is to own it in physical form... and secure it from thieves.